The cute dog cell phone stand is a perfect decor and useful tool. - It's compatible with most types of iPhone and android smartphones. - It can be used to hold most standard size of eyeglass and sunglass, and also easy to hold your business card as well. - Maybe it can hold anything on your desk in your office and home than you expect, just try it! These cute dog cell phone holders have been designed and all finished with hand painting in our AlphaGoDreamStudio. 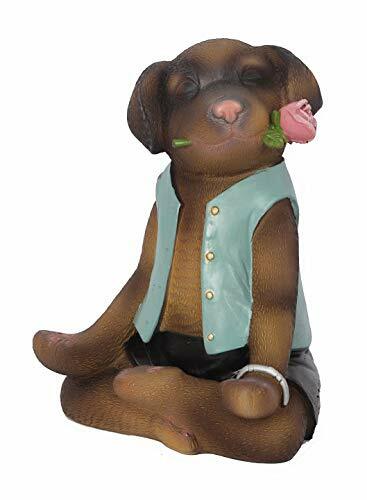 - The funny and relaxed posture of the statue make it a special and ideal gift for your family members and friends. This functional cell phone stand made from premium polyresin. - That guarantees the statue owed long life expectancy. - And also ensures the statue is heavy and sturdy enough to keep your cell phone steady. Cute dog cell phone stand with yoga posture works with almost types of smartphones. Perfect decoration and useful tool for your office or home. Designed and hand painted in our AlphaGoDreamStudio, ideal gift for family and friends. Premium polyresin material ensure it's heavy and sturdy to keep your cell phone. Product dimension: 4×4×5 IN, weight: 230 GR. If you have any questions about this product by Alpha Go, contact us by completing and submitting the form below. If you are looking for a specif part number, please include it with your message. iBOLT TabDock FixedPro 360 -Heavy Duty Metal 8” Multi-Angle Drill Base Mount All 7" - 10" Tablets (iPad, Nexus, Samsung Tab) Desks, Tables, Countertops : Great Homes, Businesses, etc.